Bridge the Gap till Spring with fun filled activities on Emerald Isle ! Well even though it is mid-February, our thoughts are rapidly turning to the spring time. The Town of Emerald Isle is planning a few fun outdoor events in March and early May to help us along. On the 17th of March, Emerald Isle will have its 27th Annual St. Patrick’s Day festival. This year’s festival will feature over 75 arts and crafts vendors, food vendors, amusement rides, face painters, and many other fun, family-oriented activities. Questions regarding the festival should be directed to Emerald Isle Parks and Recreation at 252-354-6350. As if that were not enough, you can get on your bike and join us for the 4th Annual “Bike The Banks” rides on Saturday, May 5! This increasingly popular event includes something for riders of all interests and abilities, including the 10-mile “Emerald Isle Ride”, the 50-mile “Fort Macon Ride”, and the 100-mile “Cape Lookout Ride”. 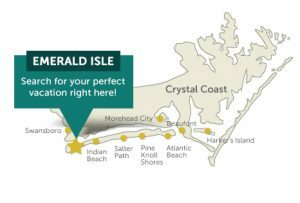 To sign up, please visit https://www.emeraldisle-nc.org/4th-annual-bike-the-banks-2018-05-05 . You see at Emerald Isle we have something for everyone, bikers, runners and shoppers. As well as just fun seekers. Join the festivities and Bridge the Gap till Spring.